Well, I've been going strong working since I got back from Chicago, so haven't had time to blog. Now it's Saturday though and I have a bit of time :-). 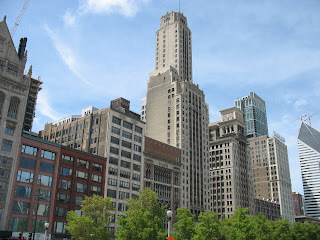 These are just a few selections of my pictures from the trip that feel the most "big city" and "Chicago" to me. I have an awful lot of pictures of buildings! 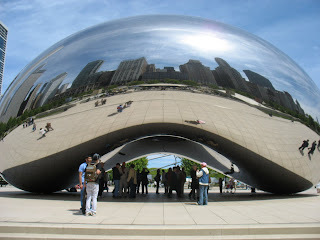 This was one of the highlights of the trip - the architecture and sculpture in Chicago was unbelievable. 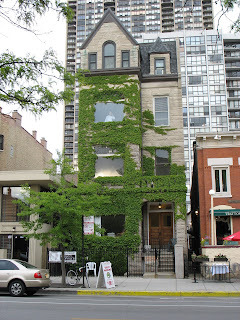 Often there would be an old old building, right next to a crazy fangled new building. So much to see just walking down the street. This "jelly bean" as we came to call it was another highlight. I have a total of 10 pictures of it I think! It's a giant sculpture inspired by liquid mercury. You can see it's enormous and reflects the whole city. If you walk inside it (underneath it) it's this crazy windy reflective thing. More buildings above. 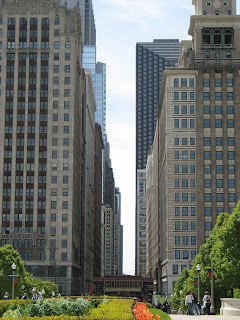 Below is a picture of the area across Michigan avenue, towards Michigan Lake, near the Art Institute. It turned out to be such a beautiful picture I had to share. Other highlights of the trip included a brief trip to Old Town. The picture below is one of a neat old building in Old Town. Sadly we didn't spend as much time there as we'd hoped. There were so many neat buildings, shops, and nooks and crannies. There was so much in such a short time. 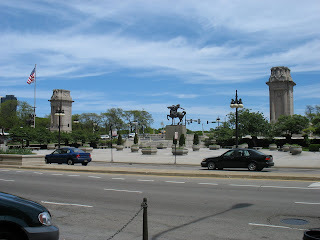 One thing that will stick with me was going to the Chicago Institute of Art. It's one of the best collections in North America (or so the tour guide book said). I saw Picasso, Degas, Monet, Rembrandt, Dali, so many amazing paintings in person! I've never been to a big gallery before. I also wrote down the names of a bunch of artists I hadn't seen before but really want to learn some more about. We also went to an amazing blues club. I haven't been so excited by music since I was playing in orchestras years ago. It was fabulous!! It was classic - we arrived at 12:30 am and stayed till 3:30 am. Other highlights were a champagne bar called "pops" (yummy elderberry champagne drinks, oysters and other nibbles), a wine bar (very nice wine and cheese), window shopping on the Magnificent Mile (Tiffany, Sacks Fifth Avenue, Bloomingdale's etc), discovering the store H&M (finally found TWO cardigans! ), Rockin' it out in the hotel room with my super roomies, Rockin' it out at the Irish bar in the hotel (nearly loosing my voice trying to talk over the loud music), meeting a number of people I go to school with and my thesis supervisor, and as with every year partying it up at the ABA social, and seeing various random people I've met over the last few years and don't see often. Ohhh one last thing - Chicago is the LOUDEST city ever. Louder than Boston, Louder than New York. Honking, nonstop honking (I'm sure it's actually a secret Chicago language), very loud sirens (I'm sure to compensate for the honking), all hours of the day. Insane! Posted by T. at 11:04 a.m.
Ahhh your pics are so good! I can't wait to access the rest of them... work flickr work! !